As I mentioned in my post on auto insurance, I am currently insured with Progressive. I switched to them because #1, they were the least expensive and #2, they offer the MyRate program. What is the MyRate program you ask? I’ll tell you! The device that they send you (for free) plugs right into your car. It monitors things such as time spent in the car, speed, breaking, excessive acceleration, etc. So obviously, if you do all of those things in excess, this program is probably not for you. The device then wirelessly and securely sends information to Progressive. It’s that easy! You really do not even know it’s there. Those are some pretty good numbers on my part. You know what that means? I SAVE MONEY! According to the renewal rate, I will be saving $105 at my renewal. A savings of around 20%! Not to bad for being a good driver. I think I will be staying with Progressive from now on thanks to this program. Anyone else using this program or planning to switch after reading this? This entry was posted in Insurance and tagged auto, Insurance, money, Saving, savings on May 6, 2009 by Adam. This is a guest post from the future Mrs Adam. As you will see, her writing style is quite different from mine and hopefully it will give you a break from my mundane babble. Hopefully, I can get her to post some more things in the future. With summer time right around the corner, I felt it necessary to give some insight on the grand task of washing the car. Most of us lead very busy lives with hectic schedules, many places to go and people to see. This type of schedule often leads to slacking in certain areas like washing our vehicles. Since we spend a good penny on our automobiles and should want to keep them clean, most of us probably find ourselves saying, “Thank God for the car wash”! Right? After all, some of us do not want to go through the hassle of reeling out the hose and filling up the sudsy bucket to spend an hour scrubbing away on the car. Especially when in 5 quick minutes you can be through a car wash with a spick and span ride. I say, to everyone that is thinking they are very guilty of being sucked into the car wash all too often, wait a minute and at least listen to what I have to say. Keep in mind that I am in no means discrediting the local car wash because after all, it has been there for me when I needed it most. As far as costs go, it should be very obvious to us that it is expensive to go to a car wash (I am mostly referring to the kind that has all the wishy-washy scrubbers that you drive through and has an air dry at the end). 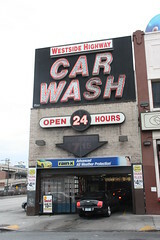 For instance, to go to the car wash you can pay anywhere from $5-$8 depending on the type of “wash” you get. The more expensive washes claim to wash extra areas and sometimes even include a clear coat rinse. We may never know if these items, worth more money, are truly worth it. Anyway, if you were to purchase one of these car washes twice a month for a year, and let’s say you purchase the most expensive one because you are easily persuaded by all the extras, it comes to a total cost of $208 dollars. $16 dollars a month may not seem like a lot, but I know I would rather have it in my wallet to use for other items like milk, eggs, and bread at the grocery store. Some of us would probably never use the car wash that frequently, but there are some out there that may even go as far as once a week to the car wash…which is $32 dollars a month (perhaps those of us more obsessed about having a nice looking ride all of the time). With things like rain and dirt appearing all too often, I would say it’s not worth going that often. 3) It’s convenient for people who do not have patience or interest in washing their own car. 4) The drying process. If you have gone to one of those car washes that offer the “blow dry” feature at the end, then you already know that it never really gets your car dry. What ends up happening is an $8 car wash that should have made your car look awesome leaves it looking mediocre because either dust clings to your wet car when driving away or you ended up with water spots all over your car. Now let’s take a closer look at washing the car yourself. You can go out and purchase all the items needed to wash a car for under $20. Once these items are purchased, you are as good as gold for a while, perhaps months, as long as you have access to a hose and a place to wash. This could end up saving you a lot of cash in the long run. Other than saving money, there are many other benefits to washing the car yourself. 2) During the nicer times of year it is a nice way to get outside to get some fresh air and sun. Even if it’s hot outside, just give yourself a mist with the hose. It actually feels pretty good! 3) You will get a much more detailed wash. Washing your car by hand gives you the ability to clean everything properly down to removing those pesky bugs that get plastered on the front bumper in the summertime. As mentioned before, the car wash will never remove all the dirt and grime, especially bug guts! 4) You have total control over the products used to clean your car. It is important to use decent car wash soap as well as a soft scrubber. Avoid scrubbers loaded with dirt and grime because the small particles could scratch the paint on your car. Ever wonder what kind of build up is in the scrubbers at the car wash? Now, I know that there are some of you out there that have read this, but still insist on using the local car wash for most of your washes and you have your reasons. But hopefully some of you that have been falling into the car wash routine will see the benefits to washing yourself and try it more often. I personally LOVE washing my car. It is a good stress reliever, I feel like I am getting some exercise, and I know that since I am paying a lot of my money for my car, I should be the one taking care of it. Many people may not know this, but DISH SOAP is VERY BAD for the paint on your car. Avoid using it at all costs. You can purchase soap specifically made to wash the car at any auto store and places like Walmart, Target, Sears, etc. I use soap by Turtle Wax that claims to put a waxy finish on your car. It’s nice. If you truly want to keep your car in good shape, then taking care of the finish is important. Waxing the vehicle is essential in keeping the finish like new. Wax blocks harmful things from eating away at the paint on your car. You should wax your car AT LEAST once a year, but I would suggest every 6 months especially right after winter when your paint finish has been exposed to things like salt and calcium from the roads. Lastly, Tires. To make your car have a complete clean look, cleaning your tires is important. Nothing compliments a clean shiny car more than a set of black shiny tires. Use a spray on foam from brands like Armor All after you are finished washing to make the tires look slick. Any suggestions from other car washers out there on products that work for you would be great! After reading this article are you more inspired to wash the car yourself, or will you continue to use the car wash despite of costs? This entry was posted in Saving and tagged auto, benefits, car wash, money, News, Saving, savings, spending on April 24, 2009 by Adam.